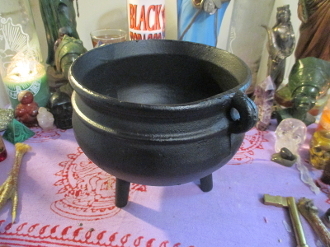 Cast iron cauldron, 7 inches high and 7 inches wide. No lid. Cauldrons are a symbol of growth, magic and abundance. They birth food, medicine, spells and brews. A symbol of the Goddess womb. Enhance your spell work and draw all forms of abundance and magic into your space. Perfect for outside rituals, group rituals, burning petition papers, ancestor money, bay leaves for prosperity, sage or incense.